I’ll Push You was screened by the Brehm Center’s Reel Spirituality initiative and moderated by Kutter Callaway, assistant professor of theology and culture. Read an additional interview with the team behind the film and explore more voices on able theology here. Bethany: I’m Bethany McKinney Fox here today with the filmmakers and subjects/characters in I’ll Push You, and in this conversation, I’m just going to ask some questions that as a viewer I was wondering about, and I was curious about and hopefully those are going to connect with things other people watching the film are also curious about. And I think that we can have a good conversation around that. So just to begin for people who haven’t yet seen the film, maybe we can hear a little bit about what the film is about and maybe Chris or Terry one of you can speak to that. Terry Parish: I’d be happy to do that. The film is about friendship, about two best friends from childhood. One of them has a progressive neurological disorder. His name is Justin, and he has watching Rick Steves in Spain and saw something about the Camino de Santiago, an ancient pilgrimage a lot of Christians have taken over the years and as well as other people. He wonders aloud if he could do that in his wheelchair and at some point asks his best friend Patrick, “What do you think?” And Patrick says, “Man, if you want to do that, I’ll push you.” And so it’s really the story of them making a 500-mile journey across northern Spain while starting to look at different elements of their life experience through that lens. Bethany: I think when we watched the movie, I feel like it’s really easy as the viewer without a physical disability to focus on your hard work in the film, Patrick, to think about this physical exertion and strength you had to go through to carry out the journey. But then, as you guys mentioned several times in the film, Justin is also working incredibly hard on the route of the Camino. It takes someone who’s on the receiving end of help; it requires a different kind of work and a different kind of strength. 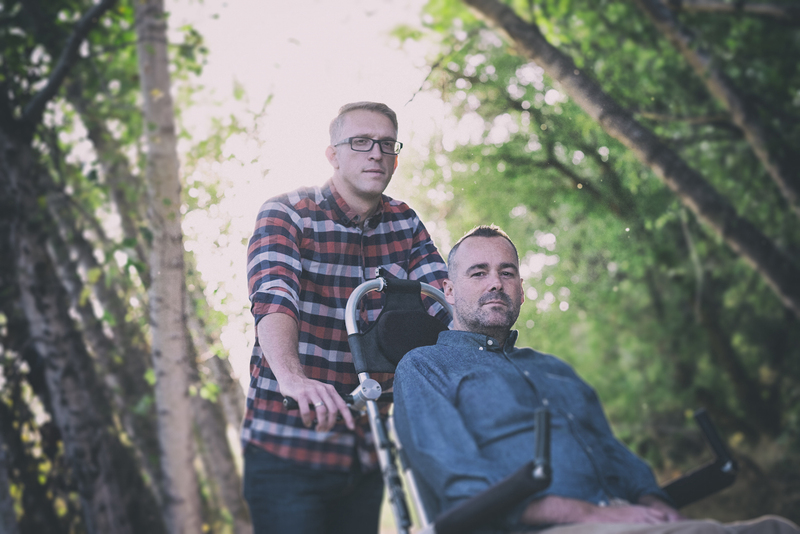 It made me think about this conversation I had with Shane Clifton who’s a theology professor at Alphacrucis College in Sydney, Australia, and he had a bicycle accident and became quadriplegic. He’s done some recent writing on the types of virtues and character traits that are necessary for him to live well in his life now and how in order to thrive and experience happiness as a person who’s now dependent in a lot of ways that he wasn’t before. He’s needed to develop different internal strengths. That was in the back of my mind as I was watching this film, and Justin, I wonder if you might share a little bit about some of that work of what it was like—that internal work. The external work is really visible, but the internal work of what that was like for you, what those feelings were, and how those evolved maybe as the journey went on. Justin Skeesuck: You bring up a really good point, because when you watch the film, you definitely see the incredible physical exertion that Patrick and others went through. That was one of the first things that really stuck out to me when I saw ourselves for the first time [in the film]; we’re living it, and then along the way we’ve had many people point out the physical exertion that Patrick did. They have the assumption because I describe it as a three-wheeled baby jogger on steroids. That’s the wheelchair that I took; it’s a specialized off-road wheelchair, and it has three wheels. People have the perception that I’m just sitting there sipping Margarita’s while Patrick’s busting his back for me, and that’s really not the case. But internally, I wouldn’t say I have some sort of tool kit I rely on to get me through difficult things in my own personal life. Living with a progressive neuromuscular disease, I am dependent upon pretty much everyone around me from the moment I get up in the morning till I go to bed at night. So what I’ve always done though is a) I’ve prayed a lot, and B) I lean on others a lot more than I typically did when I was younger just because I’m forced to. But I would probably say the biggest thing that keeps me going is I focus on why. Why I do something, not how I do something, and that’s kind of been Patrick and I. We’ve known each other since we were born. So that’s 42 years now, and a cornerstone to our friendship is that we’ve always focused on why we do something. It becomes a condition of the heart versus a condition of the mind. When I made that mental shift when I was younger working through my disease progression, I was able to walk, but then I wasn’t able to do anymore. I had to use a manual wheelchair, and now that I live in a power wheelchair, it’s definitely taken more strength each phase—especially when I lost my arms and my hands and when I couldn’t feed myself and do any of that anymore. There was a shift that I had to make in my own daily living. Even though I went through some very dark times, I always still focused on why am I here? Okay God, if this is the path that I’m on, then you got to show me what’s my purpose here? Why is this happening to me? And you can easily go into the world thinking God doesn’t love me, so he’s doing this to me. I’ve heard that from all sorts of people, but I’ve always just looked at it as, “Okay, well if this is the way it’s going to be, then I got to make the best of it somehow.” And I just keep searching for where my heart tell me I need to go, and usually when I follow that, I find myself in the right spot. That’s the best way I can answer it. Bethany: Maybe the rest of you all can speak to this as well: what was the internal and external work like? How would you characterize that? What was hard both internally, emotionally, and externally, and what sustained you? As Justin put it, what was your why to keep going? Patrick Gray: The initial work and initial why behind this whole journey is why would I do this? He’s my best friend, I wanted to, and we have shared so many adventures together—why wouldn’t I just dive it in and help it become a reality? That was the initial mindset, but as time went on and as we actually got into the journey, the physical side of things really took a toll on my body. There’s this physical phase in the first course of the journey that I’m going through. I’m becoming accustomed to some of that, and then I came face to face with a lot of my own personal demons if you will. In doing so, a lot of my why as well as my strength had to shift. My why became not just this journey and this amazing experience I have with my best friend, but it became that I got to get back to my family and be somebody different. I was not proud of who I was before, and my family suffered because of who I’d chosen to be and just some decisions in my career that had really impacted my relationship with my kids and my wife. And so what began as a journey of friendship really shifted into almost a journey of transformation for me personally. And as a result, it shifted from a physical strength to an emotional strength which I drew a lot from Justin. Just the conversations powering through questions of self-doubt, questions of just ideas of self-deprecating conversation because who I’d been. Through that, I really found a different kind of strength that carried me through the end. I wanted to show my family that I was somebody different. Terry: I think if we’re honest with ourselves, Chris and I actually experienced a lot of what Justin and Patrick experienced in the making of the film. So when Patrick says you face a lot of demons, yeah I faced a lot of demons starting on the Camino, and within the first day, my ego was pretty wrapped up in it. What I thought I was there to do, how to do it, and changing to the why was a journey that Chris and I went through as well, and I think that helped shape what we ultimately created together. But I would throw that to you Chris. And even looking at how do we find the essence of drawing the story out and what sort of story do we want to tell from our heart as an artist or anybody who’s involved in this medium? There is this challenge of what is the story, what’s the essence that is important to convey. And I think as Terry said, I think the important thing that we discovered is that there were moments when one of us was pushing, and there were moments when one of us was the person in the wheelchair. And then we sometimes would flip, and the other person would push. Chris: Symbolically right, and when we were dependent upon each other to make it through, when one of us needed the push and the encouragement. For me it goes even beyond that. I look back at my relationship with my wife, with my children, with the people around me. There are moments when I absolutely need their help or other months when they’re dependent upon me to make it through. I think in the film, without giving away any spoilers, there are moments when you realize that maybe you start off in a different place with someone that you know as a friend or a spouse. You’re both in a very different place in your life and in your perspective on spirituality or your perspective on your own sort of existence, and then at a certain point you realize that you’re together and you see it the same way. That’s where you get the idea that in some ways Patrick was pushing Justin at a different level. We’re talking about the spiritual versus the physical level. Terry: But there was some physical. One of my favorite stories though is . . . I was carrying about a 45-pound pack on my back, and we had gotten into Santa Domingo. It was a really tough and long day, and we were just trying to find a place; accessibility was a real issue in trying to find places. We ended up in this basement, and it had cobblestone flooring on the bottom and these steep stairs. I took one step up and with the weight of my pack and the 20 miles we had done that day, I fell backwards right onto my back. It was exhausting. It was really tiring. But for me . . . the hardest thing was to look in the mirror through their story and to see how I can be a very strong and capable person but may be behind spiritually and how sometimes by relying on the help of others I may be spiritually ahead. Ahead and behind is not really the right framing of that—it’s just being kind to oneself and to be gentle with the process of unfolding. Bethany: And we only help sometimes. Bethany: Like factual, the basic facts. Chris: Right and a very journalistic perspective. I think the balance we rode was recognizing that we wanted to make something that as we were going through this experience together and learning about ourselves, Terry and myself and seeing the same thing happen with Justin and Patrick on the road—we really wanted to make something people could see themselves in, and that’s what a parable is. So enough information that people can follow a story and understand it but it’s also not providing so much detail that it becomes too specific and you can’t apply yourself to it. I think that is the beauty of what these gentlemen did. it kind of transcends the idea of what was accomplished, and it’s about how far would you go for a friend. Bethany: And I can see if the goal was to capture every detail, then in some ways that would make it harder to cut down from the 13 hours. . . . You’re taking this 35-day experience and putting it into 90 minutes, what pieces you drop out you’re creating the character in a certain way. Chris: The Camino is the backdrop for the story, if I’m accurate. Terry: Yeah actually this story is more than just about what happens on the Camino. Patrick: What I love about how everything came together is that as we travel and speaking to different groups and get in conversations afterwards, the story transcends the scenes that it’s in. it transcends the Camino itself and becomes an opportunity for so many people to just reflect on what obstacles do I have in my life, what challenges am I facing—whether it’s a single mom or the recovering addict or starving entrepreneur, the theme of overcoming obstacles time and time again is that it’s the community you surround yourself with or you choose not to, not your recipe for failure. It’s been so amazing how many people don’t identify it as a Camino story. They identify it as “ see myself in this and there’s something I can do different to live a better life,” and that is profound, that is amazing to see. Justin: Patrick and I have been all around the country and we’ve met thousands of thousands of people, and that’s a whole another thing that we never thought would ever happen but seeing the brokenness that’s in this world. I mean we were speaking at a church about a month or so ago and in line—just in line of people that met us—we met three or four people that had terminal cancer. They had maybe a month or two live. What do you say that? I don’t know what to say. Because when we started this whole thing, even before I approached Terry and with Chris with this whole, we were just two idiots going on this journey together. Skip forward to less than a month ago, and I’m having conversations with people who are dying. It’s very humbling. Patrick: What’s beautiful in those conversations is people are finding hope in their relationships that they have. It’s just seeing them for something different, a new lens, and I think that’s what this world needs right now. Terry: The fact is that there’s a craving out there as Patrick was mentioning for connection and love, and it’s so available to us. It’s so available to us. There are family members available to me, but I’ve isolated myself from them for a variety of reasons. Things that get in my head and tell me like I can’t or I shouldn’t or I won’t. Whatever those stories are, there’s another story. There’s another story line that can be taken up and lived. And if people can take that from this experience and from their demonstration, from Justin and Patrick’s demonstration, then I think we did pretty good. Bethany: Absolutely, thanks Terry. This conversation takes us into something else I wanted to think about, these talks about community and who do we surround ourselves with and who is supporting us. One of the more powerful pieces to me about the film was how people were helping and pitching in. . . . People were like, “Can we hang out and help out for a minute? What can we do?” Was that typical? What was the kind of typical response of people? Did they talk about why or how that affected them? Patrick: This whole journey, there was a lot of help to be heard. There was help around every corner, and it seemed like there was so many good people pouring out so much of themselves in a variety of ways. Sometimes it was for an hour, a minute maybe. Sometimes it might be for a few days, we had a few people to stay with us for weeks, and their stories are profound. Their struggles, their pain, their suffering and their triumphs are all beautiful things that we’ve got to be a part of. And it’s just crazy when your stories collide with somebody else’s or in some ways, Justin has taught me this, you gracefully invite people into your story. Sometimes it’s stepping in, and sometimes it’s just like two stars collide and there’s an energy and a power in those conversations. There’s so much beauty, and we experienced a lot of that. But through this whole thing, I had a pretty major burden that I was carrying. I would say two burdens: one that I didn’t recognize and one that I recognized but didn’t want to face. The first burden was I had this idea that I had to do this on my own, even though I had help right beside me. I had people stepping in left and right to help me all over the place. I was in control, I was at the helm, I was in charge. And there became a point where I could have continued down that path, I could have maintained that type of control, and it all would have fallen apart. We never would’ve made it. That was a realization I had to come to terms with by saying, “You know what, my perception of safety actually rests in a perverted sense of control.” Or maybe a better way to say it is that a perverted sense of safety, and that is control. I’m a Type A personality; I’ve got to have my hands around everything. Patrick: Yeah, I’m recovering! But that’s part of the reason why my family suffers, because of that mentality. And so there’s this burden of being the one in control and driving the whole can be at the helm if you will, the captain of the ship. And turning that on its head and realizing that the only way that I can navigate this journey and life is by inviting others in and letting their stories collide with mine and augment me where I’m weak. I need to embrace the vulnerabilities I have, that is what allowed me to see the damage that I was causing. Or maybe that forced me to look at what I knew was already there and how I was failing my family. And that was a vehicle for a remarkable amount of freedom to be discovered and letting go. Chris: I recognized in the film even the times in my life in which I think as a human or a man, that there is this kind of perspective that’s kind of put on us as people, that we should be strong on our own and that we don’t need to ask other people to help us. Here we can live in a culture and society where there are people around us all the time, in our community, in our family. . . and even our own immediate family. And we feel this innate urge to try to do everything on our own and not to look to the people around us and ask them for help. And they’re right there. Bethany: Right and I think we live in a culture that really uplifts and values the helpers, and so in some ways I think because we live in that culture, who are strong and independent and the people who do the helping. We say those are like the heroes. And so I think the real reality, that the stronger position in some ways is being willing to say, “I need help.” Because we’re in a culture where everyone’s like, “Oh you’re a helper, yay for you.” The real strength, like the actual harder thing is to like not be that person. Justin: If you had a whole world full of helpers, who’s being helped? Justin: It’s a two sided coin. And in many ways, I’ve had to learn how to accept help. And I say all the time, it’s a muscle I’ve had to learn how to flex, and it’s not something you just turn on one day and say, “Oh great, I’m going to be accepting help for the rest of my life because whatever.” No, if I had my way, I would still be stubborn, and I would love to feed myself, I would. But I can tell you from firsthand experience—because I live it every day—that when you do set down that armor and let people in. . . there’s this beautiful door that’s open that lets love in, that lets Christ be shown, it lets humanity at its greatest be displayed. And scary, it’s a scary door to crack open because you don’t know on the other side whether or not that person that you’re letting in is going to burn you or not. And unfortunately it happens. I’ve been burnt, l could pretty much I’m making a really gross assumption that everyone in this room has been burnt at some point. Bethany: I think that’s a fair point. Justin: And you can’t let that dissuade you from letting the good people in, you just can’t. Patrick: Through this whole journey, both on the trail, this film coming to fruition, writing the book and really kind of digging into who we are as individuals, not just Justin and I, but just as humans, moments of vulnerability come to mind. I haven’t always seen it this way, but those are the moments where we have the greatest amount of strength. Not that it’s our own strength, but because we’re inviting people in to augment us in those moments when we’re weak. There’s an army of people around us ready to step in and help us when we need them if we choose to let them in. That is a beautiful thing, but to go even deeper, we start talking about Christ’s love. There’s this opportunity when we are completely vulnerable and we lay all that armor down. We shed the fear and the concern about preconceived notions, and actually let someone know all of us. It’s only in that moment they can actually love all of us, and without that vulnerability, they’re only getting a piece of who we are, and that’s not love. We’re actually preventing people from loving us effectively by the walls we put up. It is damaging, it’s so damaging. Justin: What I was going to say, I have some bagel buddies that everyone here hasn’t met. Chris: You need to describe why a bagel buddy, nobody knows what a bagel buddy is. Bethany: You eat bagels together? Justin: We get together, we connect, and it’s a community of people. We get together every day, we do crossword puzzles, and we talk about current events. But one of them has been post-polio for 60 years. And when I first met him, he would not let people open the door for him. He would not let you get coffee for him. He was so ingrained in this way that made him a cantankerous man to be around, and we really did not enjoy it. And so to Patrick’s point, it was damaging in a way, because there were all these people with something to give, and he could have enjoyed it. But then through this process, I had to look at how I am doing that. And I think that it’s so ingrained in us that sometimes it’d be nice to be able to say vulnerability is something that we can just put on, but I think there’s a lot of shutting that has to happen. Chris: He was at one of our early, early screenings of the film, and the conversation we had with him after was very interesting. I think he began to see himself differently and recognizing what he was missing by not asking for help. . . . And I think that gets to I think what my hope, and what our hope is around this film: I hope that in people seeing this film, maybe they’re able to see a bit of themselves. And if it’s that self who’s unwilling to open up and ask for help, I hope that they would maybe make some small move to change that. Bethany: Yeah, absolutely and that actually is something that I think Justin in the film, you at one point talk about that part of what you need to do regularly is to let go of certain things. And that it’s in that process of letting go, and I think there your phrase is that it “allows love to flourish.” That’s kind of like what we’re talking about right now. . . . this attachment to independence like fierce individualism. Maybe you can say a little more about what are those things that he’s letting go and the love the can come in and flourish? Bethany: I’ve yet to meet a normal person. Justin: Or able-bodied person, but yeah, it’s true. If you were to ask me at my core what I have to constantly let go of is that I’m always seeking God’s heart in what I’m doing and letting go of what I think I need to do. And it’s hard because I would love to do all sorts of stuff that would make my life a lot easier, but that’s not it. That’s not the case for me, and I just have to constantly let that go. And as my disease has progressed throughout my body, I’ve had to learn to let go a lot of things; running, I used to be an avid tennis player, and I can’t play tennis anymore. I gave that up a long time ago, golf, driving, then the serious stuff, eating, bathroom, showering. And I can tell you when you get to that level, it’s tough having my spouse be my primary caregiver and then having my best friends step in to that role as well. My parents stepping into that role, my brother, my brother-in-law, my father-in-law, my mother-in-law, random people, it’s very humbling. So I have to let it go, I have to let my pride go, let my independence go. And it’s tough man, it’s really tough. Bethany: It strikes me to even just listening to you, we’re talking kind of mostly about in relationship with other people—like what are these things we need to let go to let other people help us. But then I am also thinking about how each of us with God, in our relationship with God, there’s a sense of that same kind of like shedding that for love to flourish there. I mean it’s not physical and direct and concrete in the same way, but it’s like that same kind of like we have to say we can’t do it on our own and we need you. Chris: I remember a couple times in my life when I was facing some pretty major surgery that I could have been paraplegic from or and died. But I remember in the process of my wife having to take care of me, and everything I went through, I really realized that the most important thing was the love. I think I really recognized the peace that I could find in letting them in to help but also the tremendous amount of love I was surrounded by that I was completely unaware of until I was dependent upon them. Terry: And to your point, there’s always a philosophical discussion for atheists right about whether or not God is merely a projection of an element of ourselves that’s trying to help us reconcile the elements that are in conflict. And in that way, the forgiveness, how do we offer that grace to ourselves? How do we extend that forgiveness to ourselves and how do we give that help to ourselves? And can we allow it? Do we get wrapped up in the narrative of how bad we are, how awful we’ve done or how we could have done something better, or how we might have slighted a friend? And when do we let the god in us or God Himself or Herself step in and ease the pain? It can be a challenge. Patrick: Terry and I have learned even in our relationship going through this process together, there have been some very difficult experiences to be candid. . . . There’s always dynamic tension in any relationship, particularly one when we know we work so intensely on something together and we’re working long hours. But I think one of things that has come out of that experience and those challenges together is that we’ve learned to look at each other and say, “Hey.” So recognizing one another, if I’m having a really tough day, now he knows I’m having a dark moment. Patrick: I still have this image in my head that we’re told so many things that we should and shouldn’t do and you’ve got to be this way, you’ve got to be this way and you’ve got to be that way. I have a daughter who’s three, and I’m thinking about the narratives that she’s going to experience as she grows up in this world about who she has to be in order to be a beautiful woman or just to be herself. And so I think the greater sort of thing that I’ve learned in this is that to give yourself that grace just to be who you are not to project all these expectations and then to simply ask for help. Justin: Because Patrick and I were looking from afar as Chris and Terry were going through their Camino on the film, we describe it as we’re what on our fourth Camino? You know, the pre-Camino, the Camino itself, the actual Camino, then the actual making of film which is a Camino and now the release of the film which is yet another Camino. And we’re at about the 387 mile mark right now, and we’re really tired. But looking from afar and looking at the dynamics that you guys went through to find the heart, to find the heart of the story. Pat and I knew where the heart was because we’d live it, but we had to let them find it. And it’s tough, because you are stories in their hands and luckily they didn’t do like some really creative editing where a fake slap in this like Hollywood stage to whatever. It wasn’t that at all. I mean the film is real, it’s very authentic, and it’s very accurate to what we went through. And I think they put together this film that we are both just very proud of to say we knew in our hearts these were the right guys, and we’re so grateful that when we asked for help. They stepped in, but they had no idea what they got themselves into either. Justin: We’ve got lots of stories. Bethany: I have no doubt! Patrick: How long is this podcast? Terry: You’d be surprised of what dirt I have on you! Chris: There’s at least 12 and half hours of other content that we could make a whole other movie! Patrick: No, Justin and I, we’ve known each other for 42 years. We don’t have memories without each other. And that’s a pretty unique scenario. In some regards, we’ve taken our friendship for granted. We haven’t really understood that our relationship was unique until recently. Until with this journey, people started to ask these questions on, “How does that work? How have you stayed in contact? How have you maintained such a deep relationship in spite of college is a thousand miles apart? Living in different states for 20 years?” And all these questions and it really got us thinking about, okay, “What does make it tick?” I mean we point back to the theme of vulnerability and really shading the skin consistently with one another. Inviting each other into our weakness, but intentionally pursuing one another and that’s something that our society does not do well. Bethany: Yeah, that’s really true. Patrick: But for some reason that I can’t put into words, I had pursued Justin in time with him, and when I had fallen off the wagon, he’s pursued me. There’s been this constant heaven flow, but there is never been a time where there hasn’t been one of us if not both of us pursuing time proximity not just with being side by side but that emotional proximity with one another. That pushes you in a pretty unique way. So to see Justin go through a disease process, to have that friendship that we’ve been blessed to have, and then to be able to walk through that painful time of letting go of . . . I mean, he’s a graphic designer for years and now it can be a hobby but it takes way too much time to do as a trade, because you can’t keep up with deadlines. The implications of losing his hands are just huge. Patrick: Sorry that was kind of a long answer but that’s the way he’s pushed me. He’s pushed me to see that perspective, and embrace a life that love is everything. Jesus lived a life of relationship over religion and relationship in terms of religion every time. That’s the Jesus that I love, and that I want appoint to and so my life is focused on that. Justin: I echo a lot of what Patrick has said, because we see eye to eye on this. I’d probably say just in hindsight, we had to do a lot of soul searching because it is something that we’ve never really I guess thought about. Because we just love being with each other. We just love to laugh with one another. We laugh a lot. We do really dumb stuff that make each other laugh, and we’re like-minded in that. We just really do really dumb stuff and we think it’s funny—that’s at the surface level. Then when you start really getting on a deeper level, what really I think cemented our friendship together is when he stepped into a caregiver role. That brought us to a yet another level of our friendship that we didn’t know existed. So I guess it becomes the norm after a while. Then we go on this pilgrimage, then we really got to know one another. It’s a constant pursuit of one another. It’s not just with us. I mean yes, we love hanging with one another but there’s other guy friends that we have to. We try as much as we can even though Chris and Terry are in Santiago, just trying to be involved with them as much as we can. Just being constant, “Hey, how is it going?” It’s that constant pursuit of we love adventures but also we love just hanging out and being with one another. Terry: I have a question for you. Justin calls Patrick sometimes the Vice president of your inner circle? Terry: Is that right? Okay. And then there was a moment when that happened that you’ve expressed before. I guess I was wondering if that was the first time you really confronted kind of the role of caregiver, I know that it was difficult for you when you saw him starting to lose certain elements of his physical ability. What was that like for you as you were kind of watching that unfold? Patrick: That’s a lot of questions, Terry. Terry: And do you have like a specific moment that you remember? Patrick: Well the first time that I showered Justin, that was comical and painful at the same time, if that make sense. I mean it’s a lot of emotion. So I had gone down to Santiago, this is long before I met you Terry or you Chris. This would have been 2010. Patrick: It was 2010. Christine, Justin’s wife, she’s taking care of three kids and she’s taking of Justin and it’s a hard—so Justin had been talking about, “Man, Christine needs a break,” and she just need to go on a cruise with her sister the first time. And so I was, “I’m coming down. I’m going to come down. Let’s make it happen.” And I only thought it through, to be honest with you. I hadn’t actually beside from feeding Justin when they had come up to visit, I hadn’t helped him in really any major way except for maybe helping on and off the toilet when his legs were getting weak and his shoulders were getting a little weak. That was it. I mean he used to do everything. So this time I went down, I had to get him on the toilet, I had to help him after going to the bathroom, and then I had to get him in the shower and actually wash him. That is a raw intimate moment between two men. It was a combination of anger—because it wasn’t fair that he had to deal with this— coupled with just so much gratitude that he trusted me that much. Coupled with a lot of humor, I mean you have to make light of that. Here is your best friend, and we were both naked. . . . And yet in spite of the fact that this is reality now and that it’s so raw and vulnerable, he chose me to step in and be that role of that. Terry: Yeah, well I would say that he chose you, but you used the word pursued. To me one of the perfect examples of pursuit of Justin or the friendship was you didn’t think about it, you just went. In my life and background as a gay man, I’m very hypersensitive to pursuing other men’s friendships because of the wrong impression it will give and you don’t want to lead anybody on. You don’t want to make anybody angry. I think that that’s part of the beauty of what I think that story contains is that you don’t think about it, and there’s allowing of the pursuit of the friendship. Bethany: That’s really beautiful. Thanks for sharing about that. We need to wrap up. So, just as we do I wonder if each of you, this is going to be like a huge question with like this much tiny bit of time to answer. But I’m just curious about ongoing resonance of this journey. Like there’s going on the journey, but some time has passed now. So I’m just wondering about transformation and if you could each share what you feel about the ongoing place of transformation this journey has brought into your life. Patrick: Well, I’ll start; I can do it in less than a minute. I keep coming back to the greatest gift that we can give one another is the opportunity to love all of us in spite of us. And that is a hard thing to do, but I mean having a wife who loves me in spite of who I am. I don’t understand that sometimes. I don’t understand how she could love me as much she does, because I feel like she deserves so much better so often. But that’s why I want everybody to pursue that mentality; the greatest gift we can give somebody is the opportunity to love all of us, not just part of us. Justin: Yeah, I’d echo that. It’s that constant pursuit of deeper relationships with people who I love. And I’ll never arrive, but it’s a fun pursuit. Chris: Yeah, I guess it’s a difficult question to answer. I think for me it’s a couple things. One is looking at any journey, whether it’s 500 miles or 10 feet, you’ve got to take a step and keep moving and just keep moving forward despite whatever voices may be telling you, “this is foolish. This is stupid, don’t do this, it’s not going to end well. You can’t accomplish this.” I think the subtext for me is still grace. Grace for oneself, grace for the people around you, because without that you can’t recognize that moment that you’re in because you can’t be genuine with yourself. And for me at least, I realized that when I can do that, I can really experience every moment with the people I love. With the people I care about to the fullest because I’m trying to be graceful to myself. Graceful with them, and I can really experience the beauty that surrounded that, I think sometime is forgotten because we get caught up in all the garbage. Bethany: Great. Thank you. Thank you guys so much for just for your time. Thank you for sharing, letting us into your friendship and into your lives and hearts and minds and for you guys Terry and Chris and the hard work you did to assemble Justin and Patrick story and friendship in a way that we could engage with and learn from and find beauty.